Tesla appears to be ramping up on every front with the Model 3, announcing a weekend-long “exclusive delivery experience” event at its Tesla Delivery Center in Fremont for Bay Area customers awaiting delivery. Even Model 3 buyers with committed delivery dates well into September are being offered the chance to pick up their cars early in a free-for-all matchmaking event that attempts to get the right car to the right person. Day 1 of the event is already over, but we have yet to receive word about the total number of deliveries made on Saturday, September 8. However, we expect a rush of Model 3 buyers arriving in a hurry to speed away in their brand new electric cars on both days of the event. The 9 am to 6 pm two-day event on Sep. 8 and 9 requires Model 3 buyers to enter details into their Tesla accounts before heading over to pick up their cars. Presumably, the VIN matching program is being fast-tracked or even completely ditched over the weekend, but it’s clear from Tesla forums that most customers are unprepared, and many confused because they still have a way to go to complete the payment process and other requirements. Third, it could mean that Tesla isn’t having the hoped-for success with trailer deliveries or the “Sign and Drive” initiative that brings delivery time to 5 minutes or less. Fourth, this is clearly a last-minute effort judging by the number of Tesla forum members who have commented on the suddenness of this announcement. That deliveries are being pushed in a big way is encouraging. It could mean that recent production bottlenecks are easing up and Tesla is ready to accelerate deliveries to the point where car’s won’t need to be parked in a lot until it’s time for their delivery. One of the recent issues has been paint problems with the multi-coat Red and Pearl White. White is Tesla’s second most popular color in the United States, which implies a significant impact if they’re having problems with it. This could turn out to be a monthly event to clear factory-finished car inventory, but it looks like someone thought this would be a good idea to speed up September deliveries and get a group of Tesla Model 3 owners in the same place for a meet and greet of sorts. The overall impression is that this event was put together in a hurry, which isn’t surprising considering the amount of pressure that Tesla is under to meet or beat its own lofty production goal of 50,000 to 60,000 Model 3s for the third quarter ending September 30, 2018. And deliveries will be another huge component of their numbers showcase at the Q3 earnings call. 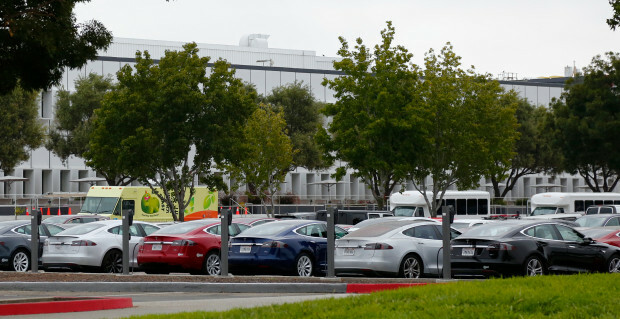 Our own estimate, which Musk has indicated might prove true, is 60,000 cars produced in Q3. Musk’s recent email to employees suggests that they’re expecting to hit about 57,000+ Model 3s produced during the period. A big push on deliveries over the coming weeks will help them achieve record numbers on the delivery front as well.